Interior environments sometimes require unique design features created with special materials or craftsmanship, or both. VMW can help realize design visions as proven in some of the projects we've completed. 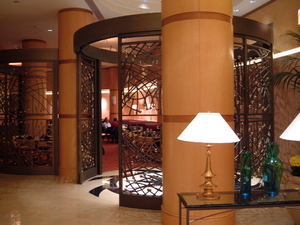 This restaurant entrance is an 8 foot diameter circular metal gate with sections of random- patterned wrought iron bars and solid polished brass finials.